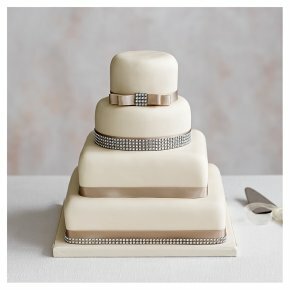 Covered in soft ivory icing and hand finished with ribbon and sparkling diamante decoration. This elegant four tier cake is available in six choices. Remove non edible decoration before serving. Filling Choice: Consists of a bottom tier of a rich dark fruit cake covered in marzipan, a 2nd tier of golden sponge with raspberry jam and vanilla buttercream and 2 top upper tiers of chocolate sponge cake with chocolate buttercream.